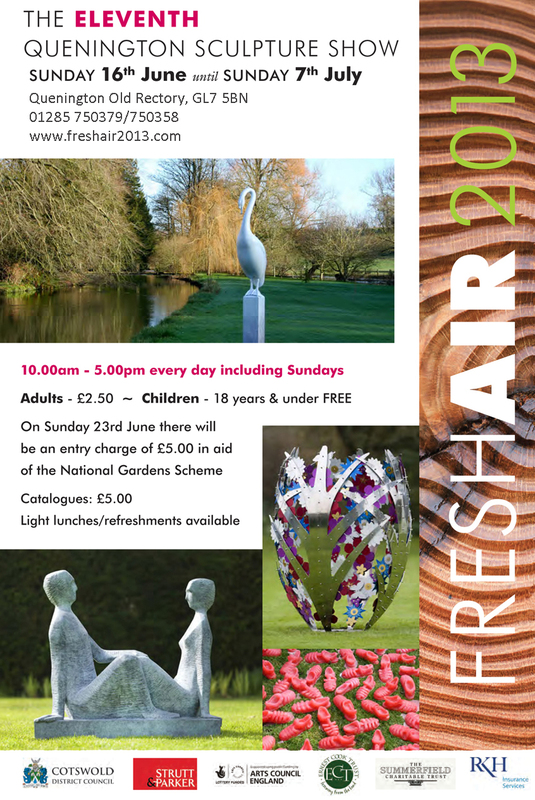 I have got a piece of work in the Fresh Air 2013 sculpture show at Quennington near Cirencester. The exhibition opened on Saturday and we were there for the opening. It is a huge show of contemporary sculpture in the open air. 140 + works in the beautiful setting of the gardens of the Old Rectory. It is incredibly diverse with work in a wild variety of materials including wood, steel, glass, ceramic and bronze. The emphasis is firmly on a contemporary approach to making, and I choose the word making carefully, as engagement with materials and crafting objects is central. It is a lively, colourful and eclectic show characterised by well crafted sculpture. If you live in the South West and you can get there go see it. Its open “till 7th July. The website is here and the flyer is below. I will blog a bit more about the show after we’ve had another chance to visit, and I will talk about my sculpture in due course!